In the end the 4th round F.A. Cup tie between Championship Derby County and Premiership Stoke City turned out to be something of an anticlimax. Stoke City started brightly and took the lead after just 4 minutes when Cameron Jerome struck from a corner. Jerome was clearly offside but the officials either ignored or missed that important fact. Offside or not, Derby County should have defended the corner better. Robert Huth sealed the victory with an 81st minute goal, again from a corner. Derby County can take some credit from this game, particularly a purple patch in the closing 20 minutes of the first half when the Rams passed the ball around magnificently and penned the Premier League side in their own half. But for all the pretty passing, the Rams failed to force Potters’ goalkeeper Asmir Begovic into making a single save during the entire 90 minutes. The injury to Theo Robinson meant Derby County started with a lone striker up front in teenager Callum Ball. Fair enough, maybe, but I’d always start two strikers at home. Disappointingly for me though was the manager’s lack of substitutions as the game fizzled away. Trailing at halftime, needing a goal to stay in the cup competition, and with attacking options on the bench, Nigel Clough stuck with the same starting-11 that had failed to test the goalkeeper all game. Striker Nathan Tyson finally entered the fray on 78 minutes but Clough’s final two substitutions saw central defenders Jake Buxton and Tom Naylor introduced. Rams Star Man – difficult to pick any one player out because Stoke City were the better team and from the moment they took the lead the Potters cruised the rest of the game in 2nd or 3rd gear. For me, James Bailey, Craig Bryson, Jamie Ward and Shaun Barker didn’t look out of place alongside the six foot plus Premier League players of Stoke City. If I had to single one Rams player out, I’d go for Shaun Barker for the way he out jumped 6’6” Peter Crouch all game and kept the former England striker quiet. Referee Watch – I expected better from Premier League referee Mark Clattenburg and his team of top flight officials. The first goal was offside, plain and simple, and the assistant referee should have seen that. Jamie Ward was clearly fouled when breaking clear and heading towards the penalty area but not according to Mr. Clattenburg. The referee also took an inordinate amount of time over awarding a Stoke City corner and clearly didn’t know which way to give it. All in all, I wish one of the excellent Championship referees we’ve had of late had been in charge for this game. Published in the Derby Telegraph on Monday 30th January 2012. Saturday’s 4th round F.A. Cup tie at home to Stoke City is exactly what the F.A. Cup – in fact all cup competitions – are about. A home game against a team from the next division up – in this case the Holy Grail of the Premier League. An opportunity to test yourself against a team who play in the division you are aspiring to get promoted to. An opportunity to provide a cup upset and become a giant killer. I’m very happy with the draw and am looking forward to the game. After we beat Crystal Palace at home, I said I’d take anybody at home. Well we were drawn out first to play at Pride Park Stadium. Ideally I would’ve liked a lower division team or a fellow Championship side as that would’ve offered a better chance to progress in the competition. But Stoke City can be beaten, particularly if their manager Tony Pulis opts to pick a less than full-strength side. Hopefully Stoke City view this game as a potential banana skin, whereas Derby County have nothing to lose and should be full of confidence on the back of a six-game unbeaten run that includes five wins and five clean sheets. Stoke City are now a well-established Premier League side with some very good players, but this is the F.A. Cup and on any day anybody can beat anybody. We can beat Stoke City and I hope there’s a big crowd of Rams fans in Pride Park Stadium on Saturday to cheer the Rams on. Prediction: Derby County 2-1 Stoke City. Potters Danger Man: This is a difficult one because there’s a lot of players in Stoke City’s squad that would start for Derby County if they were in our squad. I’m going to go for Peter Crouch, even though I suspect he will be on the bench at best with any two from Cameron Jerome, Kenwyne Jones and Ricardo Fuller more likely to start against us. Shaun Barker and Jason Shackell have formed a formidable central defensive partnership and I would love to see how they get on against 6’ 6” Peter Crouch. Previous Encounters: The first game I ever watched live was against Stoke City. Showing my age it was way back in the 1971/72 season. Obviously pre-arranged, my Dad’s friend from work turned up out of the blue one Saturday morning and asked if I wanted to go and watch Stoke City v Derby County at the Victoria Ground. I was six or seven and so excited. To be honest I don’t remember much about the game itself but the record books tell me it was a 1-1 draw with Alan Durban scoring our goal. Published in the Derby Telegraph on Friday 27th January 2012. A solitary goal from Theo Robinson as early as the 8th minute was enough for Derby County to knock Crystal Palace out of the F. A. Cup on Saturday. Overall I thought the Rams deserved to beat the Eagles, particularly in the first half when we were on top for long periods. The second half was more even and we were put under pressure in closing minutes. The foundation for the victory once again came from the back five who hardly put a foot wrong all game. For the third time in four games a clean sheet at the back meant that one goal was sufficient for victory. The defensive performance was outstanding but elsewhere the team were below par. Up front, Robinson’s poor first touch conceded possession far too easily causing attack after attack to break down; out wide, the usually influential Jamie Ward found himself well marshalled by Mustapha Dumbuya; and in midfield James Bailey and Paul Green were wasteful in possession. But a win is a win and Derby County are in the 4th Round of the F. A. Cup. The attendance of 10,113 was disappointing but, for me, the F. A. Cup has always been, and will always be, special. By the time you read this, the Rams will know their 4th Round opponents. I’m already looking forward to the draw, the 4th Round game, and the exciting possibility of a good cup run with a Premiership scalp or two along the way. Rams Star Man: The back five of Frank Fielding, John Brayford, Gareth Roberts, Jason Shackell and Shaun Barker were all very impressive in keeping Crystal Palace at bay. For me though, our skipper Shaun Barker was simply outstanding. He mistimed a header in the first minute and after that he did absolutely nothing wrong. Barks never missed another header or tackle all game, he was calm and composed, and he showed a fine touch and distribution when on the ball. Our captain now looks to be fully recovered after injury, back to his best, and his central defensive partnership with Shackell seems to be living up to expectations. Referee Watch: I thought referee Darren Drysdale had a very good game with the whistle. Drysdale allowed the game to flow, was decisive when he needed to be, and kept his yellow and red cards in his pocket for the duration. I hardly noticed him to be honest and, when that happens, you know the referee has had a good game. Well done, Mr. Drysdale. Published in the Derby Telegraph Monday 9th January 2012. As a Rams supporter Derby County delivered the perfect Christmas and New Year present over the festive period with three wins out of three. Home victories over Leeds United and West Ham United followed up with an away victory against Hull City was beyond my wildest dreams. On Saturday attention turns to the third round of the F.A. Cup and Derby County must surely go into the home tie against Crystal Palace brimming with confidence. The squad is virtually at full strength with, arguably, Steven Davies and Jeff Hendrick the only injured players who might make the starting eleven if everybody was fit. What we’re seeing now with the first choice back-five available is a much more solid, resilient, and hard to break down outfit which means one goal (although I’d like to see more, obviously) can win a game as we saw against Leeds United and Hull City. It also helps to see a more threatening front line with Theo Robinson and Nathan Tyson available again and the superb Jamie Ward supporting from wide. Most pleasing for me though is the sight of young Callum Ball taking his opportunity with strong performances and goals too. For me there remains something very special about the cup competitions. The prospect of a good long cup run excites me as does the opportunity to draw a Premier League club at home. 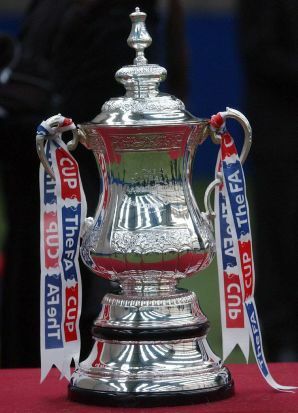 And as one of either Cardiff City or Crystal Palace themselves will demonstrate in the League Cup (Carling Cup) it is possible with good form and favourable draws for a Championship side to reach Wembley for a cup final. It’s my Mum’s birthday on Saturday and two days later she undergoes replacement hip surgery. I’m confident Derby County will earn a place in the fourth round of the F.A. Cup as a birthday present. Eagle’s Danger Man: There’s been a lot of talk about Crystal Palace’s young striker Wilfried Zaha and I’m looking forward to seeing how Shaun Barker and Jason Shackell deal with him. He is described as being fast, strong and full of tricks. Previous Encounters: There’s only one previous encounter I could possibly include here. One of my proudest moments – if not the proudest moment – of my life as a Rams supporter. 28th April 1996 [please check date] at the Baseball Ground. Win and Derby County are in the Premier League. Early in the first-half Dean Sturridge sprints through to give the Rams a 1-0 lead. The Eagles equalise midway through the first half. A draw isn’t enough for promotion but our superb captain Robin van der Laan rises highest to head home a second half corner. The Rams hold on for 2-1 and Derby County are in the Premier League. Published in the Derby Telegraph on Friday 6th January 2012. The 2-0 defeat against Hull City on Saturday was hugely disappointing in front of a 30,391 Pride Park crowd. The Rams started well, applied pressure deep in Tigers territory, and won a string of corners. On the front foot as manager Nigel Clough is so fond of saying. Slick passing, good movement, it looked very promising … but fifteen minutes in, about the time the plane made its flyover pulling the banner designed to taunt Nottingham Forest fans, the game changed. Theo Robinson pulled up with a recurrence of his hamstring injury and was replaced by Chris Maguire. Maguire would go on to have the only Rams goal attempt of note I can remember all game, an acrobatic overhead kick when we were already 2-0 down but otherwise Maguire, and virtually whole side except for Jamie Ward offered very little. Suddenly the Rams couldn’t pass, couldn’t beat the first defender with their crosses, and lost the ability to run into space. I just don’t get it. How can a team play so well for 10 minutes and then so poorly for the remaining 80 minutes. When we didn’t have the ball we were even worse. There was no closing down, no tackling, and Hull City players were allowed to run with the ball at will. Both Tigers goals came because players were allowed to run and run unchecked – first Liam Rosenior to set up Matty Fryatt and then Cameron Stewart to score on his own. A big crowd and a disappointed crowd. Those Rams fans without season tickets won’t be in any hurry to return. Rams Star Man. Jamie Ward was the exception to the rule today. He never stopped working, never stopped running and at times almost single-handedly tried to get the Rams on the front foot. He played up front, but had to go looking for the ball in midfield and out wide. He tackled, fought for the ball, and even provided cover for the rusty John Brayford at right-back. Referee Watch. An unfussy performance by Darren Deadman who went largely unnoticed for the majority of the game. Had a tendency to blow up too quickly instead of waiting to see if there was an advantage but otherwise a very competent and low profile performance. Published in the Derby Telegraph on Monday 21st November 2011. With Paul Green, Shaun Barker, Chris Riggott and Lee Croft all returning from injury to play for the reserves this week, and John Brayford likely to be available too, manager Nigel Clough will have a pleasant selection headache for a change. After two straight losses, and three defeats in the last four games, it’s not as if the players who’ve been selected in those four games are nailed on for selection. At least Derby County are likely to have a substitutes bench of senior players, rather than one filled with schoolkids. Nothing against the schoolkids – they are phenomenal prospects for the future – but it does show how stretched the Rams squad is at the moment. It might be too soon for the likes of Green, Barker and Riggott to start but it would be a welcome sight to see them back on the bench. A fit Brayford would make a huge difference as he is the only recognised right-back in the first team squad and not only strengthens the defence but adds something to the attack too. The biggest selection problem for Clough remains the forward line in the continued absence of Steven Davies and Nathan Tyson. Theo Robinson will surely start if he’s fit but neither Chris Maguire, Tomasz Cywka, Mason Bennett or Callum Ball have been able to claim a shirt in their own right yet. Saturday’s game is an important one. Derby County are above opponents Hull City on goal difference but the Tigers have a game in hand. Prediction: Derby County 2-1 Hull City. Hull City’s danger man: Aaron McLean is a striker who always impressed me during his time at Peterborough United. A prolific goalscorer in the lower leagues, Hull City signed him in January. Previous encounters: Last season Hull City left Pride Park Stadium with all three points following a 1-0 victoty. The solitary goal was scored by Gerrard. On the night Derby County created more chances but were unable to score. Rams fans will remember the game as the one in which Stephen Bywater was substituted following a back injury and young James Severn came on for his debut. Published in the Derby Telegraph on Friday 18th November 2011. After five games without a victory (three draws, two defeats), Derby County returned to winning ways when they defeated Portsmouth 3-1. The Rams were out of the blocks quickly and Craig Bryson gave them the lead on two minutes. Chris Maguire doubled the lead after 13 minutes. Jamie Ward made it three on 32 minutes. All three goals were superb team goals, created by sweeping passing moves, and Jeff Hendrick’s pass for Ward’s goal was exquisite. Most fans would have started wonder kid Mason Bennett but Nigel Clough opted for the more experienced Maguire instead. Maguire repaid the manager with a goal. Bennett came on for 22 minutes to a rousing standing ovation and showed real promise. Pompey pulled one back through Jason Pearce after 78 minutes as the Rams defended a corner poorly. The scoreline flattered the Rams who rode their luck at times, Frank Fielding’s goal leading a charmed life, but Derby County took the three points and now look forward to the visit of Cardiff City on Wednesday. Rams Man of the Match: I was tempted to say Russell Anderson who put in a brilliant performance playing out of position at right-back. But I’m going to say Craig Bryson. He was at the heart of everything, a real box-to-box performance, and set the Rams on the path to victory with a well-taken early goal. Referee Watch: Referee Craig Pawson officiated the game in a low key way and I hardly noticed him. Although it wasn’t a dirty game, he showed two early yellow cards for potentially dangerous fouls but was happy to hand out a mere talking to when fouls were routine. He turned down two optimistic Rams shouts for penalties but probably got those decisions right. Published in the Derby Telegraph 31st October 2011. Against Middlesbrough last Saturday, Mason Bennett became the youngest player to turn out for Derby County’s senior team and was inches away from becoming the youngest ever Football League goal scorer. Not bad for a player who is still at school. By all accounts Bennett will keep his place in the squad for Saturday’s home game against Portsmouth. Imagine the atmosphere inside Pride Park Stadium should a Derby schoolboy score his first senior Rams goal. I’m not sure I can imagine it, so I’d much prefer to experience it. A run of five games without a win – three draws and two defeats – have seen the Rams slip to sixth in the npower Championship. Against a Portmouth team, who have yet to win away from home in the league this season, Derby County have a great opportunity to return to winning ways. Prediction: Derby County 2-1 Portsmouth. Pompey Danger Man: I’m hoping that Luke Varney doesn’t come back to Pride Park to haunt us. His time as a Ram didn’t really work out for him, although I’m not sure it was through any lack of ability. I rated Varney when we signed him and was disappointed that he was never given a chance to show what he could do. Varney has plenty of pace and scored some wonder goals for Blackpool in the Premier League last season. Previous Encounters: Although it proved to be the worst ever season by any Premier League side, the 2007/08 season started promisingly when Derby County drew 2-2 at home to Portsmouth. I thought the Rams worked hard and played well that day and thoroughly deserved the draw. Matt Oakley gave the Rams a 4th minute lead and Andy Todd scored an 85th minute equaliser. Benjani (28th) and John Utaka (83rd) scored Pompey’s goals. Published in the Derby Telegraph 28th October 2011. Derby County made it six wins from eight games with a 3-0 home victory over Millwall at Pride Park Stadium. The win lifted the Rams to the lofty heights of 3rd in the npower Championship with only Southampton and Middlesbrough above us. It was an open entertaining game and for the first twenty minutes or so and Derby County rather rode their luck, more composure by a Lions side who haven’t scored a goal in five games now and the Rams would’ve gone behind. Two very similar goals, passed into the back of the net by midfielders Craig Bryson and Jeff Hendrick, following good work down the right by Steven and Ben Davies, saw the Rams take the ascendancy and the result was never in doubt after that. Steven Davies added a third in the second half, finishing off a flowing passing move by smashing the ball home from six yards. Derby County are now a solitary point off top spot so the home game against Barnsley on Tuesday presents an excellent chance to push on even further. Rams Man of the Match: Overall a very solid performance by the whole team with no weak links. I’m going to go for Ben Davies. He had a hand in all three goals, including two assists. His tireless workrate and quality set-piece delivery is starting to win over Rams fans and prove he can play at this level. Referee watch: Referee Colin Webster had an unfussy game, kept his cards in his pocket for the most part, and generally went unnoticed. He seemed to lose concentration immediately after the restart when he missed a few fouls but soon settled in again. Showed a willingness to play advantage and then bring play back for a free-kick if no advantage materialised. Mr. Webster has now refereed Derby County six times and the Rams have won five of them. Published in the Derby Telegraph 26th September 2011. On Saturday Derby County entertain Millwall at Pride Park Stadium and I hope it’s not going to a case of after the Lord Mayor’s Show. After giving our arch-rivals Nottingham Forest a one goal head start, plus a man advantage, and still winning away from home, the Rams will be full of confidence for the visit of the Lions. Derby County are fourth in the npower Championship with 15 points from seven games. Millwall sit 16th with seven points from seven games. Away from home the Lions have won none, drawn one, and lost two. The game represents a great chance for the Rams to consolidate their position in the Championship playoff positions. It’s not going to be easy, no game in this division is easy, but if Derby County can produce the character and spirit they’ve demonstrated for most of this season, character and spirit that was there for all to see at the City Ground, then I’m confident the Rams can win again. Score Prediction: Derby County 2-1 Millwall. Millwall’s danger man: Well I’m not going to say ex-Ram Jordan Stewart that’s for sure. 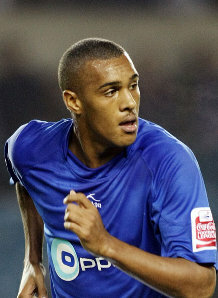 For me it has to be striker Jay Simpson. He’s currently on loan from Hull City and has Premiership experience from his time at W.B.A. He scored six goals for the Tigers last season. Previous encounters: I’m afraid I can’t recall too many standout games against Millwall and, with apologies to the majority of Lions fans, the memories I have of past encounters are not good. I remember Millwall fans ripping the seats out of the Normanton End at the Baseeball Ground and hurling them at other supporters. I also remember the playoff 2nd Leg at the Den when Rams goalkeeper Martin Taylor had to run the gauntlet to get off the pitch unscathed. Let’s just hope it’s a good and trouble free game on Saturday, remembered for all the right reasons. Published in the Derby Telegraph and on Derby County Mad on 23rd September 2011.